Very Good. Make Me (with Bonus Short Story Small Wars): A Jack Reacher Novel (Jack Reacher Novels) by Child New York Times Bestselling Author, Lee. Glued binding. 576 p.
Very good. 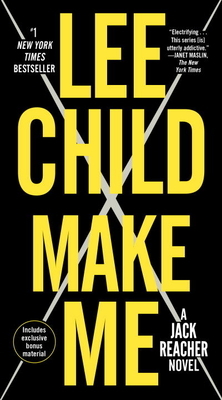 Make Me: With Bonus Short Story Small Wars (Jack Reacher) by Child, Lee. Good. Make Me (with Bonus Short Story Small Wars): A Jack Reacher Novel (Jack Reacher Novels) by Child New York Times Bestselling Author, Lee. Glued binding. 576 p.